The trolley makeup case with lights VT101C, spacious and sturdy, is the most classic and best-sold mobile makeup station of the Cantoni range.It is perfect for salons and for beauty artists on the move and it grants the best professional image and an effective and hygienic makeup and hair-style service whenever and everywhere. Light structure, sturdy and compact to carry, usage-resistant. Spacious slots inside. Quick set-up system, thanks to the integrated telescopic stands. Chrome details with Cantoni logo engraved. I-light system: the only lighting technology specifically designed for makeup: natural, neutral and without areas of shadow. Patented by Cantoni. The chromed hinges of the makeup trolley are designed and manufactured by Cantoni to grant durability, resistance and the correct tilt of the mirror. The inside of the makeup case is in thermoformed PST: a light, shockproof, electrically insulating and fireproof material. Easy to clean, it doesn't fade over time. The inner space is divided into 7 compartments of different dimensions (See technical specifications). The bigger spaces are supplied of metal, heat resistant panel lids with a magnetic lock. When the upper panels are open, they work as support for palettes or hair dryer/iron. 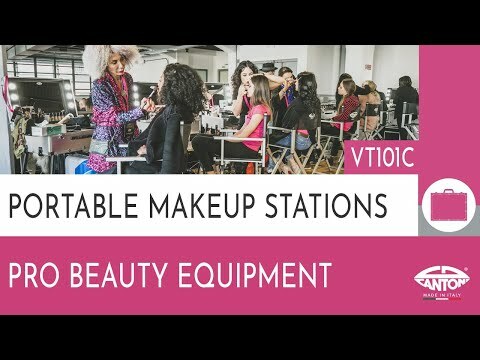 The VT101C portable makeup station is easy to clean with a damp cloth, and, if necessary, adding delicate cleansing. the print of your logo (the logo will be marked in white on the lid or/and on the mirror): choose the option, complete the order and then send us an email with your logo. We recommend to send it to us only in vector format (.AI or .PDF, only 1 path). Logos in other formats cannot be printed. Handy for transport, this portable makeup case has perfect lighting performance. The outstanding quality grants you the most professional impact.